Fur! The well-dressed cat is wearing fur, unless you’re one of the those Cornish Rex or Sphinx cats. I’m also wearing a very trendy feather boa over my stylish gray and white furry tuxedo. It’s all about accessorizing. I’m actually wearing a Diva Stick that TW bought me. Since I wouldn’t play with it, she thought I’d look stunning wearing it. Trust me, this is the most dressed up you’ll ever see this little ghetto kitteh. 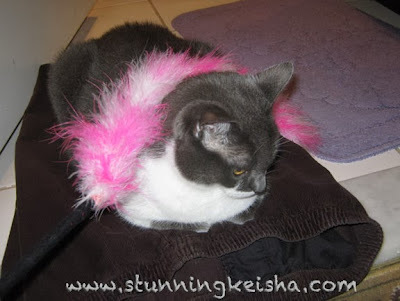 Diva Sticks—what all the feline fashionistas are sporting. Do you have any fashion tips to share? Wow - SWOON - you are looking fantastic CK. Love that Boa - very pretty on you. Since I'm a Tuxie, I'm always fashionably dressed in my tux. 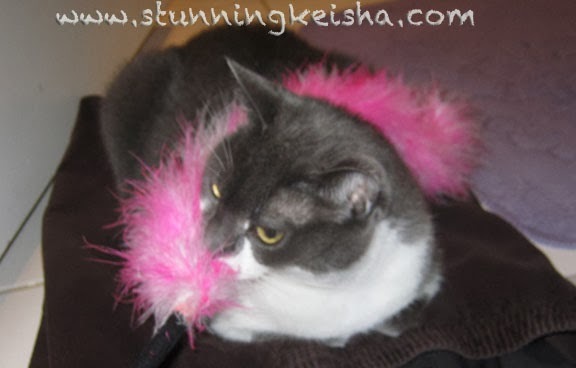 A feather boa looks smashing on you! I don't know CK - you don't look too happy all boa-d up there. We're not into fashion, CK, though we do sport some pretty cool collars. I think a Diva stick as an accessory is very festive and fun! Hmm. No, I think the best-dressed kitty is wearing a sleek and form-fitting fur suit. I like your natural furs, but pink is a good color for you! Great. Now WAFFLES wants a Diva Stick. i purfer my birthday suit really! Pretty in pink. Have a tremendous Thursday. You are looking mighty fine in pink CK! Tutu says she needs a Diva Stick! ohhhh...I so need one of those!!! Well I think it suits you CK. Not too flashy - and if you get tired of wearing it you can always play with it. Dual purpose you might say! Oooh, tres chic, CK! We bet ALL the ladycats are gonna want one of those now! Allie: Oh girlfriend! Only the very BEST well-dressed girlcats wear PINK. Geez, CK you're quite the little menace, aren't you? Gotta watch out for the Humans--they're surprisingly breakable! Mes HATES it when Mommy tries to put clothes on! Mes always gets the claws out! Ooh la la you do look maaahvelous, Darlink!